A deep side part and bent ends make a blowout anything but basic. A deep side part and bent ends make a blowout anything but basic. "It's a choice look if you're hitting the dance floorâyour hair will bounce along with you!" notes Eugene Souleiman, global creative director of Wella Professionals, who did the style at the left. To prevent frizz, hand cream can double as a surprising hair savior. Rub a bit between your palms and, once absorbed, smooth over flyaways. How to get the look: Apply a blowout cream to damp strands and blow-dry. Form a deep side part and tie hair into a loose ponytail over the opposite shoulder. Mist with hairspray, roll the pony up to the base and pin. Blow-dry for a few minutes to set the shape. Unwind and brush through. "This gives a softer wave than you would get with rollers," says Souleiman. Final step: Make an entrance! 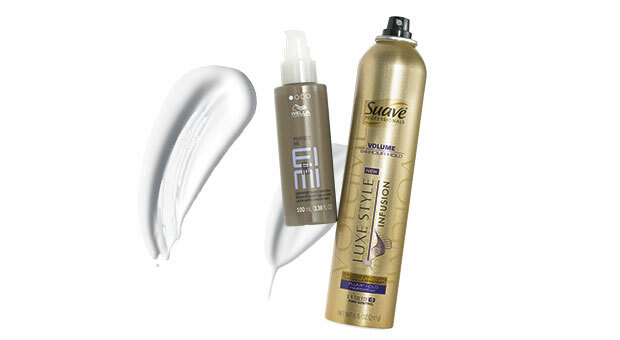 Pro picks: Wella Professionals EIMI Perfect Me ($19, ulta.com) and Suave Professionals Luxe Style Infusion Plump Hold Hairspray ($5,Â amazon.com).